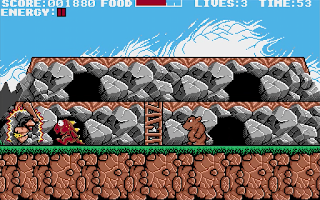 Prehistorik is a cute platformer which takes us back to a time long ago when dinosaurs roamed. You are a caveman with a club - so imagine something like BAMM-BAMM from The Flintstones but a lot older and with a beard too! Now, add the psychotic desire to club cute prehistoric dinosaurs and you have the perfect game. The object is to explore this prehistoric world looking for food which will mean daring to enter into an angry beast's cave! Lots of dinos are roaming the planet and some are huge requiring several hits. 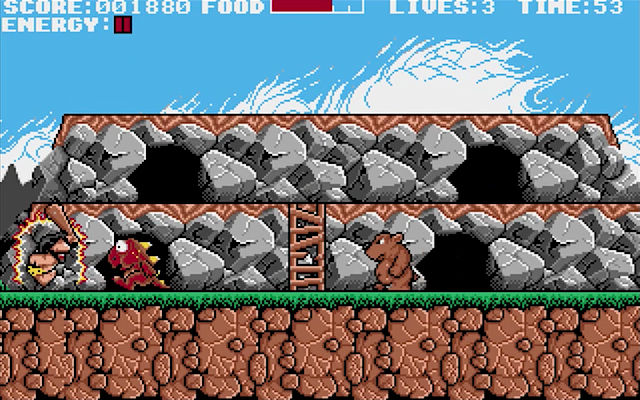 The visuals are pretty and cartoony with well-drawn backgrounds and each sprite looks absolutely gorgeous. The characters each have their own unique personality and wear some brilliant expressions too, especially when knocked unconscious. 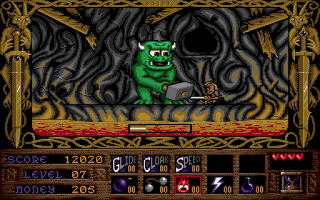 Take a leap and club the green monster while his back is turned but watch out when near a cave entrance!! Prehistorik is a no-frills platformer but don't let that put you off because it's tons of fun and stuffed with hilarious action. It's almost like a Jurassic version of Grand Theft Auto and clubbing cute animals will always be great fun. It's cute, it's violent and very addictive so wear your animal skins and play from either floppy or hard disk. The assorted "Cyber" packages released in the 1980s by Antic Software where some of the most creative applications for the Atari ST. I always remember being mesmerised by the 3D modelling that was often being demonstrated by the magazines. The work of magicians, no doubt! 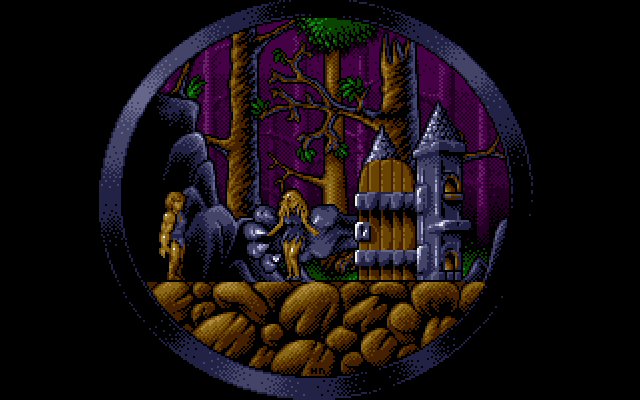 Laughably, I also remember having a dabble in Cyber Paint but my artistic gene must surely have been DoA (although I did have a play with NEOchrome and FlairPaint to create my own Dragon's Lair work - sadly long since lost). Much later in the ST's lifetime, these apps were released on magazine cover disks and I have such "fond memories" of pushing my mental capabilities to the limits with Cyber Studio CAD-3D. It looked so easy from those articles...! There is no denying that the Antic catalogue is rich and deep in the ST's history. You should be further impressed when you realise Autodesk owes its roots to these old Fuji apps. Interesting ancestry when you think about - thank you Atari ST. So why am I talking about these warez that bamboozled me? Martin Doudoroff has written an awesome article called "The Antic Cyber Graphics Software". It's certainly an interesting read with fascinating a detail of history and I hope you guys enjoy it as much as I did! If I'm honest, I feel a little unqualified to review Team because I'm not a soccer fan. From what I played, I liked. I'm hardly a new convert but I did enjoy running around the pitch and having a good kick about - great fun! However, not knowing the game's technicalities stops me from progressing further. Interestingly, there is a friendly mode that displays off much of the game's styles and playability, like passing, tactics, and tackles. Hmm sounds fun? The left image is captured at the standard ST resolution of 320x200 whereas the game is in sweet overscan! Overscan is used to drastically increase the playable area which I have tried to demonstrate by placing the loading screen alongside the gameplay animation. Strangely, the footballer sprites are quite small but their movements are extremely fast and the screen is fluent at a smooth 50fps. Sound effects are good but everything is a little too quiet, which is odd for a game being played in a stadium of thousands of people! 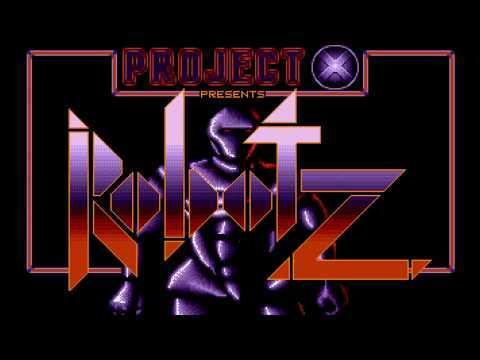 Thankfully, the music is excellent with stereo tracker playback routines developed by a familiar name from the Atari ST demoscene - GRIFF! Overall, I had lots of fun with Team which shocked me because I hate soccer! 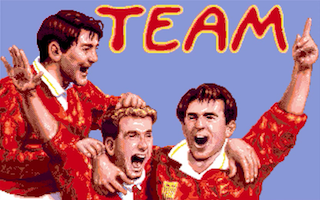 Whether it's better than Kick Off or Sensible Soccer, I couldn't say but I certainly enjoyed it so give Team a chance and take it for a kickabout. - Download Team from 8bitchip which has been adapted for hard drive installation! - Old Games Finder has access to floppy disk images. - Team's author, Ralph Lovesy, was interviewed for Maggie #16. Viking Child is the tale of a young boy called Brian who is thrown into an adventure that takes him through several medieval lands in search of his friends. He needs to rescue them from the clutches of the evil demigod, Loki. 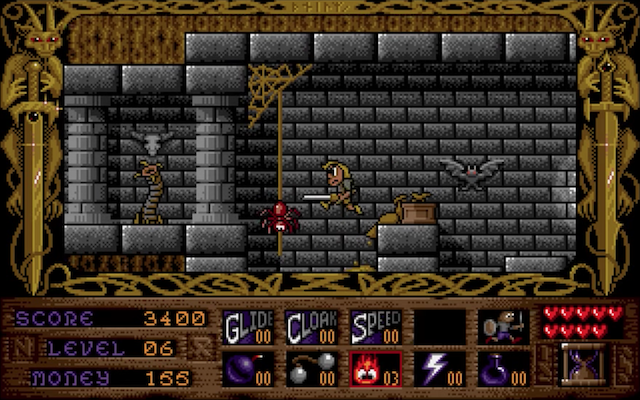 Now, it might look spookily familiar to a console gamer but don't be put off, this is a great Atari ST game in its own right. 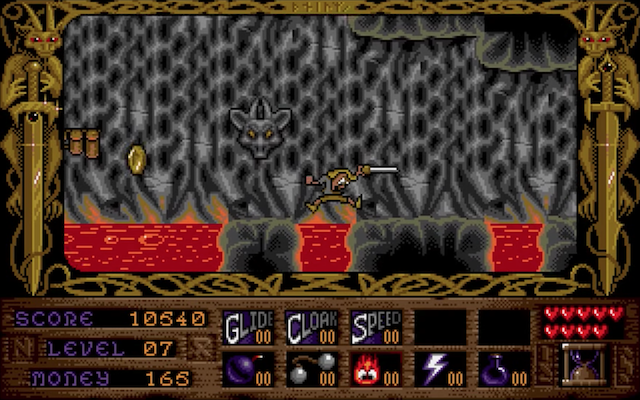 There are a humungous 16 levels of platforming fun to plunder with 8 bosses to battle long before you even think of reaching Loki. Walk and leap over all obstacles and use your weapon to kill anything that looks likely to hurt you. 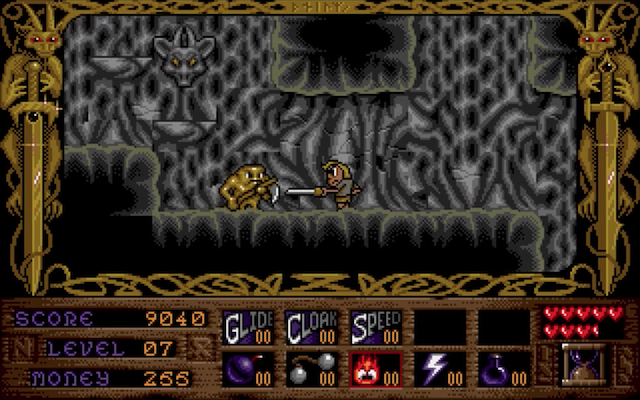 After a monster is slain, coins are left behind to be used as currency in the local power-up store which offers better weapons and the usual assortment of goodies. I love the fire weapon but I first advise that you upgrade your main weapon - a dagger. Sadly, this I fear is far too short so upgrade it as soon as possible for something bigger! What an incredible array of monsters to battle. Just look at the grumpy expression on this fella! Graphics are excellent with super smooth scrolling proving yet again that the STFM is more than capable when in the hands of a talented programmer. I love its gorgeous cartoon-like scenery and the sprites are well detailed, even if the animation is humble. Sound effects work great but you can exchange those for excellent chiptunes if desired. Viking Child is a creative and technical masterpiece. What it lacks in originality is more than made up for in playability. Entertaining, interesting and challenging gameplay throughout with aesthetics to drool over! This is a cracking game and you soon realise why it's one of my favourite platformers on the Atari ST. I highly recommend this one, folks!! 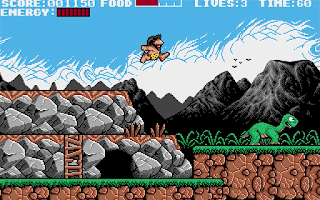 Download Brian's adventure from 8BitChip to install onto your hard drive but those who require the floppy disk images can grab 'em from Old Games Finder. Here are a few level codes to skip your way forward: Forest level: DENIS<E> / Landbridge: THE BLIZ / Labyrinth: SHARKMAN / The Desert: NYMHARSW. Enjoy yourselves!! Overscan Invaders was released in 1994 by Janet Dean under the esteemed semi-pro Budgie UK licenceware label. This is obviously Space Invaders but with an unexpected twist: you're playing in overscan which is a feature not normally exploited by the gaming scene. There are also a number of other improvements to stop it from being a predictable invaders clone - like lots of improved graphics with double the number of on-screen colours and authentic retro sound effects. Plus the title screen is humorous with cool music and I can sit there all day watching it! Of course, this is Space Invaders but it's superb to see a game pushing the hardware with some cool technical wizardry. However, it's gameplay is what matters and I'm happy to say this has an authentic feel along with a bucket load of addictive old skool action. One of the better clones I have played and I’m sure all Invader fans will enjoy it. 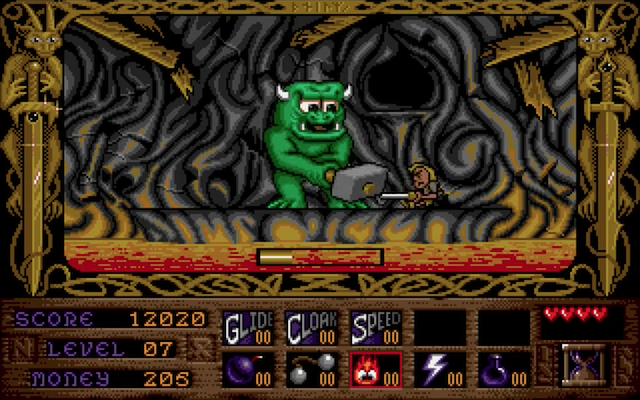 - Overscan Invaders came on a floppy disk which is found using Old Games Finder. Thalion games ooze a superior visual and audio style which few others could match. 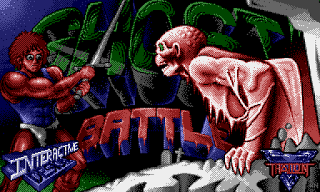 However, I don't think I've ever played Ghost Battle which is very odd as I'm a fan of platformers and Thalion! We are the stereotypical muscle-bound hero who needs to rescue his kidnapped girlfriend who was recently whisked away by a giant hand. Yes, a giant hand!! So be prepared to travel through some of the most beautiful words trying to find her. The goal is to kill everything in your wake but I fear the control and basic gameplay mechanics are a little awkward. Sadly, movements feel stiff which will take some getting used to because it feels like plodding through mud and it doesn't help when deadly objects appear from out of nowhere to zap valuable energy. Our weapons aren't exactly good because their rate of fire isn't quick enough to meet the demands required for a quick kill. So, no matter how many times you try to rapidly hit that fire button, most monsters will manage to survive which is really annoying! The graphics are astounding with stunning artwork and smooth scrolling - which is faster on the Atari STe (or older ST's with a Blitter Chip). I'm reminded of a varied mix of Ghouls And Ghosts, Risky Woods, Stormlord and maybe even a tickle of Shadow Of The Beast? It's hard to imagine a game more beautiful and then the audio matches this in equal measure. It's fabulous. No, I actually think it's far beyond fabulous and it's all thanks to Mad Max! - 8BitChip have a hard disk game with floppies found using Old Games Finder. - Take a read of this and lots more related stuff at the Thalion Shrine. Stop! Download Sea Of Colour demo for the Atari STe right now! Have you ever spent time trying to learn a game only walk away completely baffled and wondering why you bothered? 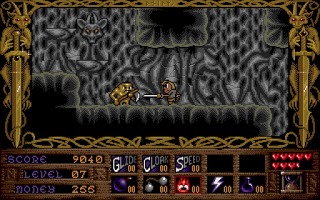 Well, here is Dragon Lord, an extremely unusual multi-screen platformer released in 1990 by 16-32 Diffusion. We are playing the part of a huge dragon who appears to be living in a whole wide world of weird! 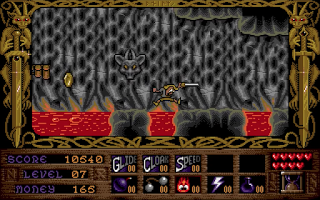 The objective is to become the new dragon lord which means plundering through over a hundred screens looking for artefacts, killing some fascinating creatures and ultimately battling an evil guardian. Gameplay is simplistic thus easy to pick-up and it's fun breathing fire onto a scorched enemy. I found the map design a little laborious and would often end up getting lost so I would instead spend my time burning down the bad guys!! However, the control a clumsy because we are a massive dragon sprite moving around tight environments. The visuals are quite (ahem) unique. Pretty amateur artwork that looks like it was coloured in by somebody suffering from colour-blindness. Ignoring this graphical nightmare because Dragon Lord’s sprites are massive and also of a great and humorous variety! Sadly the sound effects are pretty much a joke and the less said the better! Overall, I was quite disappointed because I can see the potential but it doesn’t gel together very well. 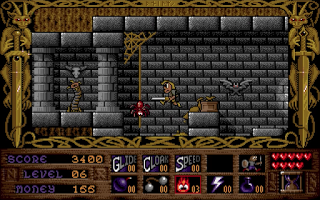 Dragon Lord's poor mechanics and eye-bleeding graphics spoil what could have been an interesting game. Having said all that, I did find myself having “just one more go” yet I cannot for the life of me think why. Perhaps I'm going mad?